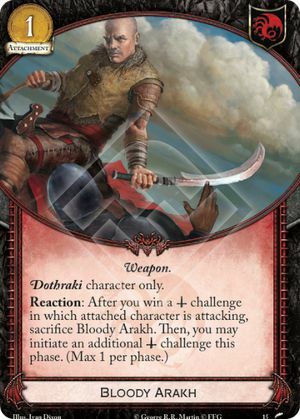 (Max 1 per phase) refers to the reaction from all cards named Bloody Arakh; no matter how many you have in play, you may only trigger one Bloody Arakh per phase. (Max 1 per phase) does not affect how many additional mil challenges you can make through other effects (e.g. Khal Drogo).